Cement backer board is frequently used in the construction of “conventional” tile and marble shower walls. Subsequently, a cement mortar shower base is built over a waterproof membrane that connects to a special drain containing weep holes in its base. 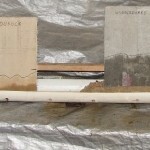 The membrane (shower pan liner), which extends up the walls to a point above the shower curb, is laid over a “pre-slope” of mortar that pitches it toward the drain. Water, then, is collected in the liner and conveyed to the drain weep holes. One topic that frequently comes up during discussion of construction methods for traditional shower pans is the matter of how to firmly attach the CBUs in the area of the membrane. Because the membrane cannot be pierced, mechanical fasteners must stop above the curb. This, of course, leaves the bottom portions unfastened and free to bend inward. A method commonly recommended is to set the backer boards a half-inch or so above the pan liner on the shower floor and use the final deck mud layer to hold the bottom of that board firmly against the blocking (shower pan backing). The argument begins when someone suggests that embedding the CBU in this manner will allow water from the deck mud to be wicked, via capillary action, far up into the wallboard, causing harm. Now, one of the purposes of properly constructing a traditional pan is to ensure that any moisture that finds its way into the final mud bed will quickly and easily follow the pre-sloped waterproof liner to the open weep holes in the clamping shower drain. There will be no water near the wall intersection of the shower pan liner to be wicked up into the walls. That area will get wet during shower use, of course, but if the floor drains properly, no water will ever remain there . But what if some water were somehow able to pool there? How high will the water really be wicked? Let’s have a look. To test the wicking action of various types of cement board, I constructed a test mockup with a trough that could be filled to a consistent depth of about 3/4 in. with water. Half the trough was empty, the other half was filled to the top with deck mud. Half the samples were set in the bottom of the trough, the other half embedded in the fresh deck mud such that the bottoms would be just above the water level in the trough. The trough was then filled to the control level with water. Holes in the side of the trough keep the water from going above the design level, allowing it to cover each of the samples in the open portion and the mud bed to the same depth. In an attempt to more closely imitate actual shower conditions, the test bed was refilled with water at least once a day on most days, keeping it constantly wet, and not at all for periods of more than a week at times, allowing it to completely dry. The test mockup was in a covered, but not conditioned, space, and the testing was monitored for a period of approximately one year. Dark lines were drawn on each sample at the end of the test period to make the maximum wicking level of each sample more visible in the photo. Here’s what the test setup looked like at the end of the year (Click to expand). During the times when the test bed was allowed to dry, all the sample boards dried as well. There was no wicking as there was no water to wick. When the water depth was brought back up to the stable level, all the samples would again wick up to a level near what you see in the photo. The level of maximum wicking was not dramatically different between the samples that were in standing water and those in a saturated mud bed. The wicked water reached very close to the final levels before the test was two months old. Unfortunately, I did not record the actual dates when the change became minimal or non-existent, but photos shy of two months into the test look much the same as the final photos. I can’t prove the wicking would not have reached higher levels in another couple years, but it wasn’t increasing at a measurable rate after one year and I wanted to be done remembering to water it or call home to remind someone else to water it. If there is standing water in your shower pan, there will be wicking up your CBU, whether your CBU is actually sitting in the water or just buried in saturated deck mud. If there is no standing water in your pan, there will be no wicking. Given the maximum level of the wicking in this test, and given the level of water damage found in shower walls I have torn out over the years, I must conclude that much of that extra water must come from somewhere other than the shower pan. I didn’t conduct any testing where actual wall wetting would take place over time, but I can imagine no other way water would get all the way to the lower two or three feet of a shower wall. It appears to me that even a constantly flooded shower pan could not produce that kind of damage, but it’s still a situation to be avoided. And I see no reason at all not to continue advising folks to extend their CBU walls down into the final deck mud of their shower floors for support. It’s a good construction method for those who build CBU showers with traditional pans and doesn’t appear to me to have any real drawbacks. CBU in the mort>Backerboard next to drywall and wicking?